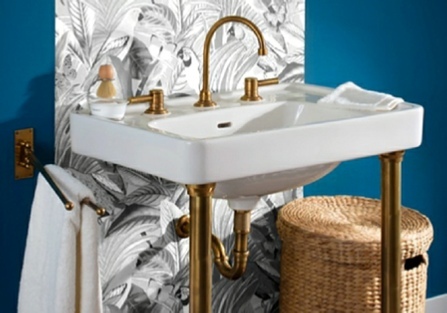 The ‘Art Deco’ Washstand and ‘Lille’ Kitchen & Bath Faucets feature clean lines and modern shapes with a nod to traditional elements. 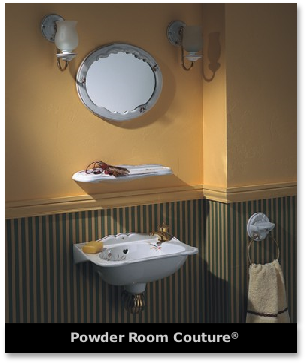 Accessories includes new ‘Art Deco’ Towel Bar, Lighting Fixtures and complete line of “Lille” Accessories. Shown in new (47) French Weathered Brass finish. Click on picture for all Herbeau Items for 2018.
with Eco-Brass. 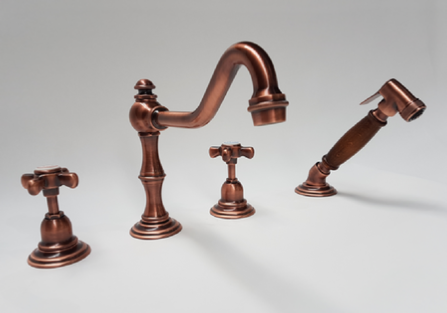 Old World craftsmanship and sustainable style come together to create faucets that are naturally beautiful from the inside out. Herbeau Kitchen Couture® presents the “Lille” Series of Kitchen Mixers. 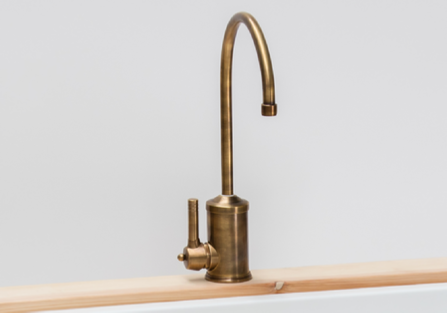 The 4115 “Lille” Single Lever Kitchen Mixer is shown in Antique Lacquered Brass (68). out of style. Shown here in Antique Lacq. from FSC certified renewable forests in Europe. Oak is also an ideal wood for high quality cabinetry, having first been steamed at a high temperature to ensure stability. 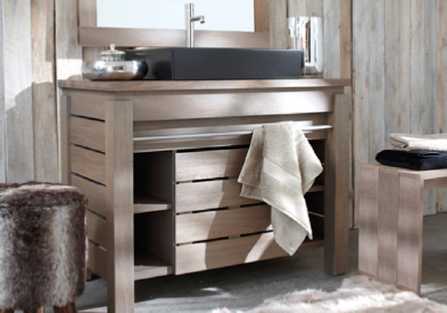 The entire Oak Collection is available in 8 oiled, waterproof finishes and designed to coordinate with virtually any style of bathroom. 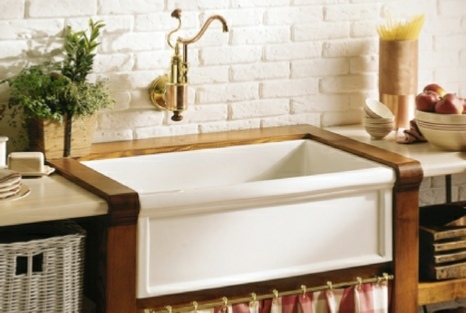 Copper Couture® - this showpiece sink adds the warmth and charm of copper to a kitchen. 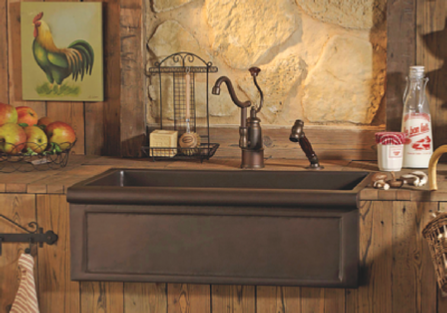 Herbeau copper sinks are pre-weathered through a special process that ensures a deep, lustrous patina. 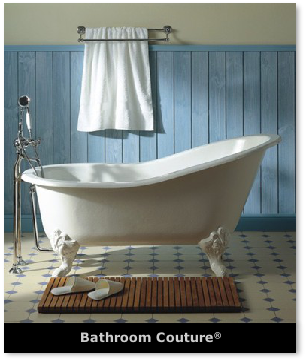 Bring back the art of bathing with this classic cast iron tub. Sculptured metal feet and authentic cast iron construction combine luxury with vintage appeal. Customize the look with a metal finish for the feet and a handpainted design on the tub. 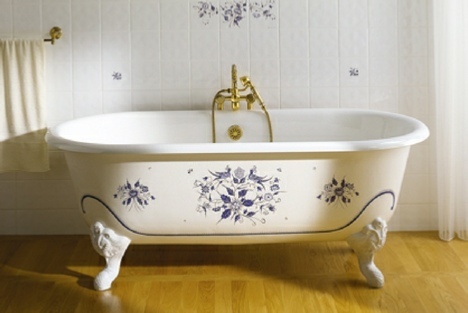 Tub is available in White (20) or choice of twelve handpainted patterns. The feet can be customized in nine metal finishes. Shown in Moustier Bleu (02). The Luberon's distinctive French Provencal style evokes the rustic beauty of Provence while the sink's fireclay construction ensures a smooth surface for years to come. Available in six solid colors and twelve handpainted finishes. Inspired by the fixtures used in French cafés and bistros, the Royale is traditional, yet informal. 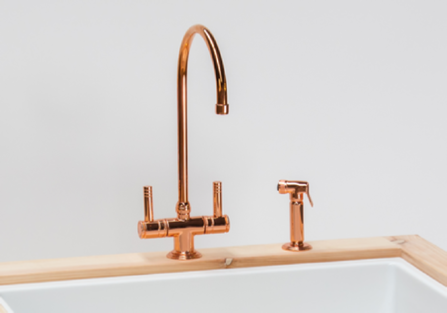 An ergonomic single-lever handle allows for effortless control of water temperature and volume. 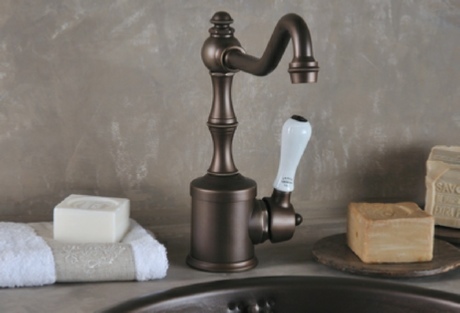 Substantial in size and weight, the wider base and 8¼" hook spout make this faucet ideal for use with larger sinks. Shown in Weathered Brass, the Royale is available in nine finishes, with wooden or ceramic accents. The art of an ideal- with its emphasis on purity, restraint and tradition, the Empire takes its design cues from Neoclassical architecture. 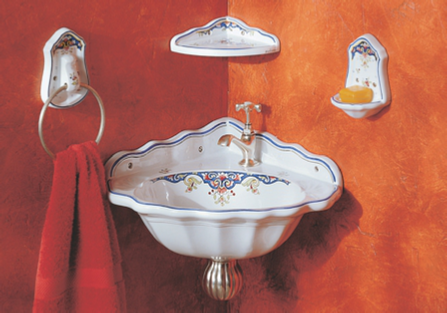 Washbasin shown in White (20); also offered in a choice of twelve handpainted patterns. Washstand shown in Weathered Brass (70). Herbeau is pleased to present world-renowned Winckelmans tiles. The company’s wide range of decorative and vitrified tile products has made Winckelmans a favorite of architects and designers. Established 1894 in northern France, Winckelmans expertise in producing extremely high quality vitrified ceramic tiles has been developed and passed down through five generations. At the company’s six million square foot manufacturing facility, a team of 150-plus employees produce tiles of unsurpassed quality and beauty. 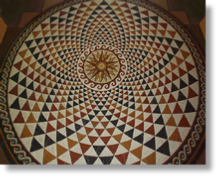 Winckelmans tiles are available in over 5000 standard tile designs and a wide range of shapes.